Dr. Chad Libraty is very excited to be a part of the elite team here at Associates in Comprehensive Dental Care. 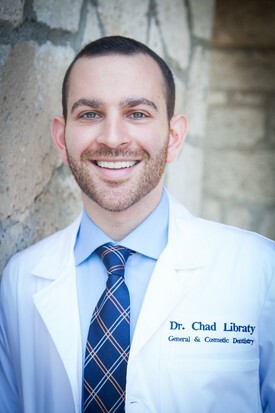 Dr. Libraty's talents and specialties are practicing as a cosmetic and general dentist and performing smile makeovers. His vision is for every patient to achieve a state of health and wellness and improve their self-image. Dr. Libraty is extremely passionate about dentistry as it changed his life from a young age. His own smile was transformed through experiencing every dental procedure as a young teenager. His personal dental experience as a patient grew into a true passion for helping others and transforming smiles. Due to this, providing a gentle and pain free experience is of utmost importance to him. Dr. Libraty is a proud graduate of a top 3 dental school in the nation, University of Maryland School of Dentistry. He graduated with clinical honors and continues to be involved in continuing education events. He then continued his clinical education as the Chief Resident at a General Practice Residency in Brookdale Hospital. Dr. Libraty treated cases ranging from esthetic full smile makeovers, to emergency teeth and facial injuries. Dr. Libraty recently got married and moved from New York City to Vermont. He and his wife are thrilled to experience all that Vermont has to offer including the hiking, skiing, local breweries, and Ben & Jerry’s.